Cambridge Audio CXUHD review | What Hi-Fi? The understated CXUHD is among the very best Ultra HD Blu-ray players around. According to legend, during the Lumière brothers’ screening of one of the very first films in 1896 (Arrival of a Train at La Ciotat Station) the audience was so convinced by what they were seeing, they anxiously believed the locomotive was actually going to crash through the screen and into the cinema. Over 120 years later, that story indicates just how powerful the silver screen can be. 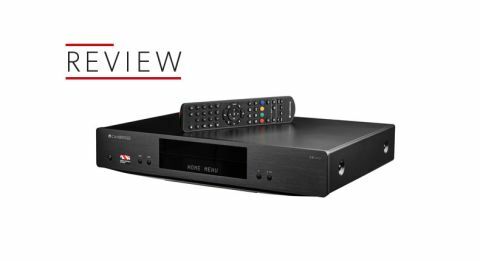 And Cambridge's latest Blu-ray player, the CXUHD – as well as being the company’s first 4K Blu-ray player – is certainly up to the task of bringing a realistic image to your screens. From the outside, the CXUHD looks a lot like the company’s older CXU Blu-ray player - but Cambridge has redesigned the internal circuitry to decrease signal interference, with the aim of improving audio and picture quality. Around the back, there are two USB 3.0 connections, two HDMI outputs – one v2.0 for audio and video, and a v1.4 for sending audio straight to your sound system – as well as an HDMI 2.0 input for plugging in a set-top box or streaming stick. There’s also a RS-232 interface for connecting PCs, an ethernet port to back up the CXUHD’s built-in wi-fi., and optical and coaxial outputs. The CXUHD supports all popular hi-res file formats from your NAS drive or server, up to 7.1 channel, 192kHz resolution. Support for Dolby Vision – Dolby’s form of Dynamic HDR – means this Ultra HD player can optimise the picture on a frame-by-frame basis. Setting up the CXUHD is straightforward. The remote, which remains unchanged from the CXU, still feels nice to hold and the buttons are pleasingly tactile. There’s a backlight button for use in the dark, but if we’re being picky we still prefer the motion-activated lights on the remotes of some rival manufacturers. MORE: HDR10 vs Dolby Vision HDR – which is better? Unlike other Blu-ray players, there are no on-board streaming services (such as Netflix or Amazon Prime Video) in the CXUHD’s menu screens. This may seem like an omission, but Cambridge has put the focus on getting peak audio-visual performance – and has bet on the likelihood your 4K HDR television has those apps installed anyway. If, for some reason, your television doesn’t have them – or if you’re using this player with a projector – we’d recommend plugging an Amazon Fire 4K TV box, Google Chromecast Ultra or Apple TV 4K in the player’s spare HDMI input. We start off with a 4K HDR Blu-ray of Planet Earth II and are impressed by the way the player renders the rich green trees and clear blue waters of the Caribbean islands. It’s a different characteristic to that of the Oppo UDP-203, which has punchier colours by comparison. It might look more impressive initially - but it’s a touch overblown, and we prefer the realism of the CXUHD. We watch as a pygmy three-toed sloth slowly climbs trees, and the amount of detail the CXUHD manages to extract from the disc is impressive. Consider the textured cracks and ridges of the tree bark - this player delivers an image so natural you can even imagine the sound it is making. During a close-up of the sloth’s sleeping face, there’s a sophisticated sense of depth and detail as the sun strikes its coarse fur. Switching to the Ultra HD Blu-ray of Harry Potter and the Philosopher’s Stone, the CXUHD demonstrates great handling of light and darkness. The way the light falls across Vernon Dursley’s face is nuanced and well-balanced, with his blotchy red cheeks worthy of particular commendation for their realism. Even in the gloomy halls of Hogwarts, the CXUHD doesn’t struggle. In darker scenes, the detailed sculpture of pillars and the scratches on stonework are still clearly visible when the titular wizard delves into the darkness. The CXUHD retains its realistic character even as we switch down resolution to a 1080p Blu-ray of Logan. As expected, the range of colours is more restricted than you’ll find in a 4K HDR film, but the player takes the smaller range in its stride. When Wolverine attends a funeral near the start of the film, the strands of scraggy hair and tiny droplets of water in his beard are visible without being overly emphasised, while the range of greys and blacks on his drenched coat look convincingly slick. The player handles the movement of torrential rain bouncing off his coat nicely, and as the camera pans around the scene the CXUHD remains smooth and in control. This player will happily upscale your DVD collection too. We slip in a DVD of The Truman Show and are pleased the CXUHD renders faces, clothing, and even the felt office walls of Truman Burbank's office with a minimal amount of noise. The CXUHD’s noise-reduction settings eliminate almost all noise in the picture - but it's at the expense of reducing some detail if you go too far. The CXUHD has good sound performance too, giving a transparent rendition of Elton John’s I Guess That's Why They Call It the Blues from his Live At Madison Square Garden Blu-ray. With a suitable amplifier and speaker set-up, the CXUHD has a great sense of space – it wraps the cheering audience around you on both sides while paying sufficient attention to his vocals. Compared to the Oppo UDP-203, the difference in impact as Elton pounds away at the piano keys is much better conveyed by the CXUHD. You can really feel each strike much more tangibly as the energy of the track rises, and it’s difficult to resist tapping your toes along to the beat. It’s also tighter and better organised at the low end. The weighty notes have a well-defined shape - the CXUHD’s sophisticated handling of frequency extremes provides layers of low frequency information rather than an amorphous blob of bass. That quality remains with CDs too, as Vivaldi’s Concerto In E Major builds and falls away with nicely managed intensity. The call and response of the strings’ deep hums, midway through the piece, push forward and retreat swiftly. If you’re putting a good recording through this player, don't doubt you'll get a good rendition out of it. Getting a suitable system for this player won’t come cheap. You’re looking at a premium surround sound set-up, and then a top-notch television or projector on top of that, to do this player justice. But if you already have those things, Cambridge's CXUHD is a great addition. This Cambridge may not seem as initially impressive as its most obvious rivals, but extended auditioning reveals an understated character with a focus on accuracy – a more admirable quality than succumbing to the allure of an overly punchy, unnaturally sharp picture. In summary, the CXUHD is undoubtedly one of the best 4K Blu-ray players around. We like it a lot.